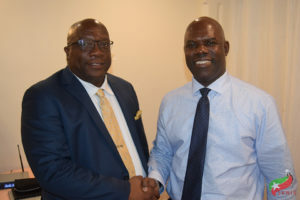 Basseterre, St. Kitts – The Team Unity administration’s sound fiscal management of the country’s resources came in for high praise from the Bankers and Financial Services Association of St. Kitts and Nevis at the Nov. 28 consultative dialogue with economic and social partners. While addressing Tuesday’s discussion, which was attended by members of the cabinet, senior government officials, as well as representatives of the private sector, the banking sector and the legal fraternity, President of the Bankers and Financial Services Association Gordon Julien commended the government on the strides taken in moving the economy forward, stating that when the economy does well, the banks in turn perform well. “A lot of the economic indicators that we are seeing are moving in the right direction, and as such I also want to commend the government for having this consultation in preparation for the budget,” Julien said. In 2015 and 2016, the Team Unity government has shown surplus on the recurrent account, the overall account and the primary account. The per capita income for St. Kitts and Nevis grew from US$15,739 in 2014 to US$16,978 in 2016, moving from a position of fourth highest in the region then to second highest in 2016. The public debt, which stood at 77.6 percent in 2014, continues to trend downward. At the end of 2016, the federation’s debt-to-GDP ratio stood at 64.5 percent – the lowest among independent countries in the OECS and CARICOM. Prime Minister and Minister of Finance the Honourable Dr. Timothy Harris said the issue of de-risking continues to be a work in progress and that the government has sought a more regional approach in response to this challenge. “The region has sought to mobilize our partners internationally,” he said. “For example, Prime Minister [of St. Lucia] Allen Chastanet and I visited Canada and other capitals and attempted to put forward the case of the region in relation to this very specific matter. The Bankers and Financial Services Association of St. Kitts and Nevis was formed in 2001 and comprises The Bank of Nevis Ltd., the Bank of Nova Scotia, CIBC First Caribbean International Bank Ltd., RBTT Bank Caribbean Ltd., Royal Bank of Canada and the St. Kitts-Nevis-Anguilla National Bank Ltd.